Spider webs were strung across the window frames, hanging like sticky threads. A spider sat in the corner, waiting for some tiny insect to accidentally fly into the web. The smell of mold was thick in the air, as well as the odor of mothballs. "Lauren, I don’t like it up here," said Kellen, holding onto the back of his big sister’s skirt. "There are spiders and probably mice, and it smells funny." Don’t be such a baby," she chided. "It’s only a room. Everything in here is old. Mum never comes up here to dust. It does smell terrible," she added, sniffing the air. She reached over and flipped the light switch. A lone light bulb, with no cover over it, illuminated the small room. Kellen looked around. The light cast shadows on the slanted walls. "It’s still scary," he whined. "Oh, Kellen, stop it. Now, come and help me look." "What are we looking for?" he asked. "Treasure. I heard Mum talking to Dad and they were saying there were some treasures in the attic," she told her brother. Her eyes were shiny with excitement. "Treasure? Wow! I wonder if it’s gold, or big jewels. I’ll help," Kellen said. They moved a few things around and found a large trunk. "Maybe the treasure is in here," Lauren said. "Come and help me lift the lid." They had to use all their strength to lift it. Suddenly it fell back. Much to their dismay, the trunk was filled with old clothes. "Clothes? Ooooo, there is that horrible smell again. What is it?" Kellen asked, holding his nose shut with his fingers. Lauren shut the lid quickly. "Mothballs. Let’s look around more." For about half an hour they searched through boxes and behind piles of papers. "What’s this?" Kellen asked. "It looks like a musical instrument." Lauren went to see. "Help me pick it up," she said. The two of them lifted it over their heads and moved it into the center of the room, where it was clear. "It’s a harp!" she said, amused. She plucked a few of the strings. "It’s an old Celtic harp. I remember Mum telling me grandpa MacEwen used to play one. Even his grandpa played it. This must be really old." "Let me try," Kellen said. He plucked at the strings with his fingers. "It sounds pretty, but I want some treasure. Let’s put that harp back and find the gold." Lauren plucked a few of the strings. She felt strange. It was as if the harp had some magical spell over her. She thought it sounded beautiful. She plucked it a few more times. "Lauren!" Kellen called. "Let’s find the gold!" "Forget the gold, Kellen. This is better than gold. This is music and it’s beautiful. Help me carry the harp downstairs," she commanded. Kellen, disappointed at not finding any gold, helped his sister carry the harp into the living room. They sat it down in the middle of the room. Kellen ran outside to play. Lauren ran into the kitchen and brought back a cloth to wipe the dust. She spent an hour polishing it. She pulled a chair from the table and sat next to the harp. She started to pluck the strings. They vibrated in her hand and sang a lovely song to her ears. Just then her mum and dad came home. 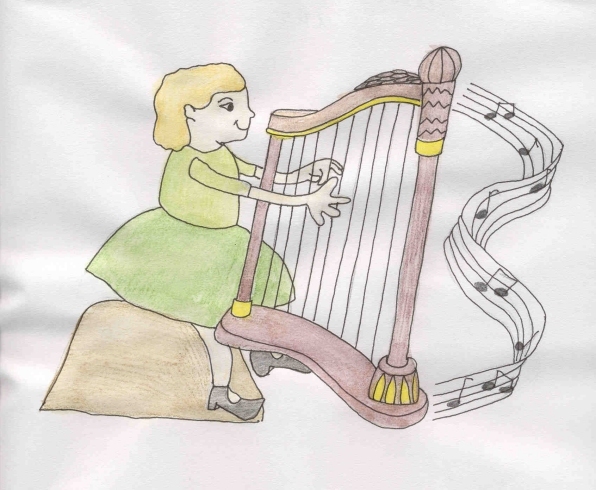 When her mum saw the harp, she stopped and stared, her mouth agape. "My father’s harp. Where did this come from?" she asked Lauren. "Kellen and I found it in the attic. It was covered with spider webs and dust. I cleaned it off. It’s beautiful, Mum. It’s like magic, isn’t it?" Lauren said. Her mum sat down on the chair after Lauren got up. She reached for the strings and started to play the harp. Lauren whispered, "Mum, I didn’t know you could play the harp." "I thought I’d forgotten, but when I sat down to play it, all the memories came back and here we are. It’s a magical instrument, so beautiful, so peaceful," she said. Kellen came running in the house when he heard the music. He’d thought it was Lauren. "Mum? It’s you. When did you learn to play the harp?" he asked. "This harp was my great, great grandfather’s. He made it. I had forgotten all about it. Now that its here, I’ll start practicing again," she told him. "Mum, will you teach me to play?" asked Lauren. "Sure, honey, any time you want," she replied. "I know now what you and Dad meant when you talked about treasures up in the attic. This harp is a treasure, isn’t it, Mum?" Kellen asked, seeing a tear run down his mum’s face. "Yes, Kellen. It’s a treasure." From then on their house was filled with music and each time Lauren saw the harp, wooden, carved, with shiny strings, she thought about her great, great, great grandfather McEwen, and said a silent whisper to him for giving them the gift of music and beauty in their home.